Rockstar Energy Suzuki’s Clement Desalle won today’s Italian MXGP at Trentino in Italy for round four of 18 in the FIM Motocross World Championship. 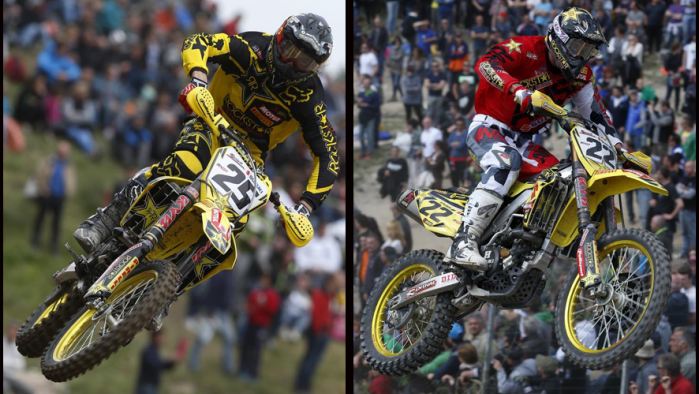 It was the Belgian’s first victory of the season in front of 25,000 European spectators hungry for their first taste of high-level motocross action in 2014. Desalle was faultless on the toughest racing surface of the year so far and his results of second and first in the two motos on the RM-Z450 led to a convincing success; his first since the 2013 British Grand Prix. Joining him on the MXGP box was team-mate Kevin Strijbos; the Belgian earning his first silverware of 2014 for an emphatic weekend overall for the Lommel-based factory crew. After trips to Qatar, Thailand and Brazil, the Arco Di Trento circuit in northern Italy was the first location to see MXGP land in Europe and – for the second year in a row – the riders found a tight, windy, slippery and difficult layout. The Italian hard-pack was unforgiving in the bumps and concrete ruts that formed through the weekend (and with European and WMX series on the support card) and the compact nature of the track, meant hectic and bustling first-laps where the starting prowess of the riders largely dictated the order of the top-five. Using 2015 RM-Z450 engine power as well as a new chassis, Desalle was able to find traction and confidence in these trying race conditions. He followed Gautier Paulin in the first moto and set-up the first result of the day with a largely unchallenged run. The second race was tremendously exciting as mistakes by the likes of Jeremy Van Horebeek and Tony Cairoli, not to mention a mechanical problem by Paulin, saw four riders disputing first place. It was Desalle who held firm and his first chequered flag of 2014 led to a maiden triumph of the campaign. Strijbos was optimistic for Sunday despite a difficult qualification race on Saturday where the veteran was searching for optimum set-up. He was able to reach the top-five in the first moto, just without the extra-speed to make the difference and threaten the top four. Strijbos withheld an attack from Tony Cairoli in the final stages and repeated the feat ahead of the World Champion in the second moto to log third position. It was a vindication of the former championship runner-up’s belief after some testing Grands Prix so far in 2014. The results in Italy today mean that Desalle now retains 158 points in the MXGP World Championship standings; a gap of 17 to Cairoli and a gap of four over Van Horebeek. Strijbos is sixth. There is little pause this week for the Belgian Factory team as the Grand Prix of Bulgaria will see the paddock reunite in Sevlievo on Friday. Round five will take place at the steep and fast circuit (more hard-pack soil) for the final GP event in April and before trips to Holland, Spain and the UK in May. MXGP World Championship Standings (after 4 of 18 rounds): 1 Antonio Cairoli (ITA, KTM), 175 points; 2. Clement Desalle (BEL, Rockstar Energy Suzuki), 158 p.; 3. Jeremy Van Horebeek (BEL, YAM), 154 p.; 4. Maximilian Nagl (GER, HON), 144 p.; 5. Gautier Paulin (FRA, KAW), 137 p.; 6. Kevin Strijbos (BEL, Rockstar Energy Suzuki), 109 p.; 7. Todd Waters (AUS, HUS), 89 p.; 8. Evgeny Bobryshev (RUS, HON), 81 p.; 9. Joel Roelants (BEL, HON), 76 p.; 10. Shaun Simpson (GBR, KTM), 72 p.